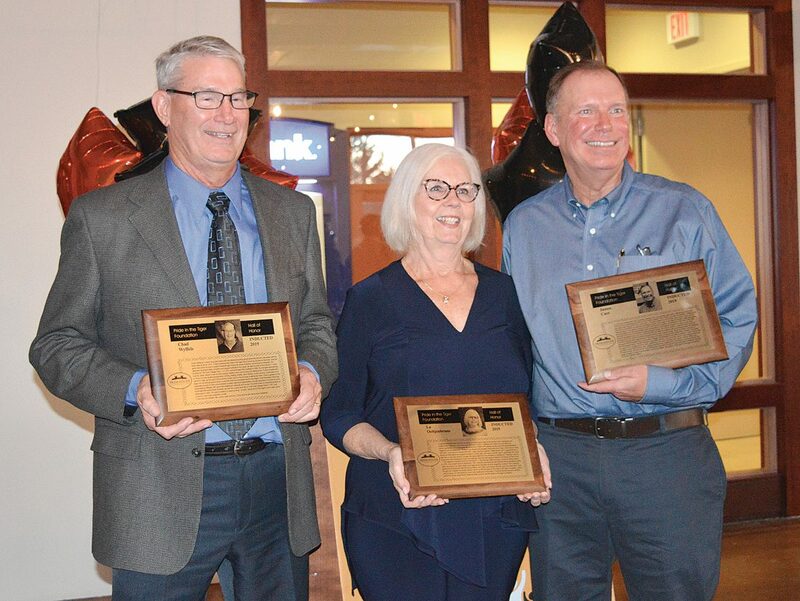 Photo by Deb Gau From left to right, Pride in the Tiger Foundation Hall of Honor inductees Chad Wyffels, La Oeltjenbruns, and James Carr were presented with plaques at a banquet Saturday evening. The three were recognized for their contributions to Marshall schools and the community. MARSHALL — Over the years, they had supported Marshall’s schools in many different ways. Now it was their turn to be recognized. “Thank you so much for being part of the Pride, and thank you so much for being part of Marshall,” Pride in the Tiger Foundation Executive Director Janel Wartner said, addressing the three newest members of the Foundation’s Hall of Honor — Chad Wyffels, La Oeltjenbruns, and James Carr. At a Saturday banquet, the foundation inducted Wyffels, Oeltjenbruns and Carr into the Hall of Honor. Since 2000, the Hall of Honor has recognized Marshall alumni, faculty and staff members, and community members for their support of their local schools and community. The Pride in the Tiger Foundation’s mission is to provide financial and other support for the educational programs and activities that help children’s growth, Wartner said Saturday. This year, the foundation awarded more than $60,000 in classroom grants for Marshall K-12 schools, and awarded 143 scholarships totaling more than $150,000 to Marshall High School graduating seniors. The foundation also supports programs like an ACT prep course for high school students, Wartner said. Wartner said each of this year’s Hall of Honor inductees have contributed to Marshall schools and to the community in different ways. A graduate of the MHS class of 1971, Chad Wyffels was also part of the 1970 Marshall basketball team that made it to state competition, Wartner said. As the owner, and now co-owner, of Borch’s sporting goods store in Marshall, Wyffels has played a role in supporting local athletics. Borch’s is a corporate sponsor at Southwest Minnesota State University. Wyffels has also supported school organizations, and youth organizations for basketball, baseball and hockey. “This is a great pleasure,” Wyffels said of the Hall of Honor induction. He said he was honored to be a graduate of MHS. “I had wonderful teachers and got a great education” in Marshall, he said. Wyffels also thanked his family, including his wife Sandy and his parents, for their influence and support in his life. He said his mother and father “instilled the work ethic in us,” that’s stuck with him in his life. Oeltjenbruns was someone “Who kept everything running smoothly,” not just for the schools, but for the Pride in the Tiger Foundation, Wartner said. Oeltjenbruns served as secretary for former elementary school principal Bill Swope from 1989 to 1999, and then as assistant for former Marshall superintendent Tom Tapper. She was also involved with the Pride in the Tiger Foundation from its very beginning, helping it become a nonprofit and organizing Hall of Honor banquets. Oeltjenbruns said the people she met while working with Marshall schools have been a source of joy in her life. “They gave me so much, so many rainbows,” she said. She got to see the unique qualities of each Marshall student, as well as those of faculty and staff members and their families. “I want to keep reflecting that light,” she said. James Carr is a 1981 MHS graduate, a Marshall businessman, and a community supporter. This spring, the Carr Family Foundation will be awarding eight $2,500 scholarships for graduating Marshall seniors. But Carr is also unique in the Hall of Honor, Wartner said. “James is our first second-generation inductee,” she said. Carr’s parents, Robert and Phyllis Carr, were inducted to the Hall of Honor in 2015. “Giving from the (Carr Family) Foundation is a family affair,” and one the whole family takes seriously, James Carr said. The Pride in the Tiger Foundation, with the support it gives to future generations, has been among his family’s top causes. At Saturday’s banquet, Carr also said it had been “a tough couple of weeks” for him recently, as a potential new business that tried to buy property in Marshall declined after negative reactions from neighbors. However, Carr said as he reflected on the situation, he turned to the Rotary’s Four-Way Test as a guide. He said we should always ask whether the things we say and do are truthful, fair to all concerned, build goodwill, and are beneficial to all concerned. “We should look for solutions to problems, and be part of the solution,” Carr said.